Time for this year's Rib Eating Challenge! Miramar Fire-Rescue and Texas Roadhouse Miramar is inviting the community to participate in a special event! 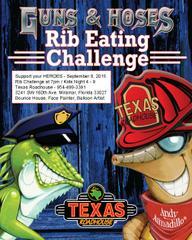 Join us for this year's Police Vs. Fire Rib Eating Challenge on Tuesday, September 8th at the Texas Roadhouse restaurant located at 3241 SW 160th Ave, Miramar, FL 33027 from 4-9PM. Miramar FD will be raising funds for the Susan G. Komen Miami/Ft. Lauderdale organization, a part the world’s largest network of breast cancer survivors and activists. Fun for the whole family and a great cause. Hope to see you there!